The AMX International AMX is a ground-attack aircraft for battlefield interdiction, close air support and reconnaissance missions. 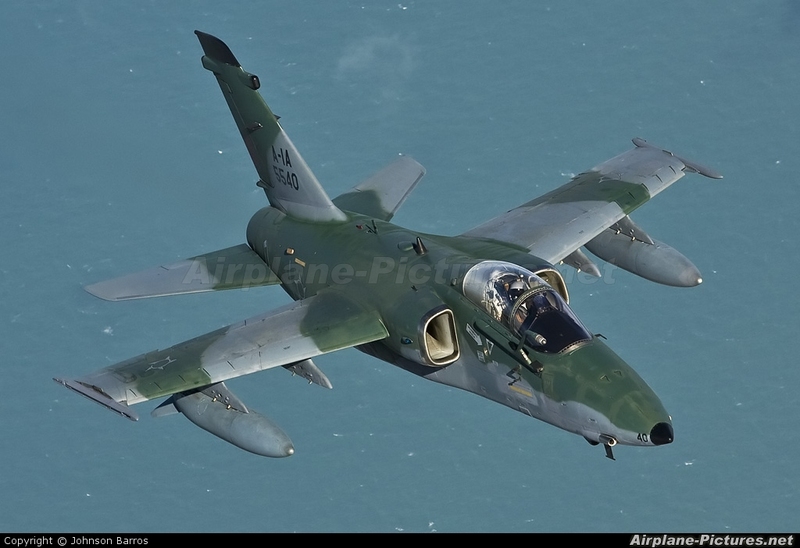 It was built until 1999 by AMX International, an Italian-Brazilian joint venture. The AMX is designated A-1 by the Brazilian Air Force, and A-11 Ghibli by the Italian Air Force. The AMX is capable of operating at high subsonic speed and low altitude, by day or night, and if necessary, from bases with poorly equipped or damaged runways. Low IR signature and reduced radar equivalent cross-section help prevent detection, while low vulnerability of structure and systems aid survivability, while integrated ECM, air-to-air missiles and nose-mounted guns provide self-defence capabilities. This kit comes stuffed into a fairly large box, which upon opening does not have a great deal of air inside. The moulding is crisp, as we have come to expect from Kinetic, and there is very little flash and ejector pin marks are confined to the inside surfaces where for the most part they won't be seen. The kit appears to be engineered to produce a single or two seat aircraft, so there will be much to feed the spares box with. Optional parts are provided to build a Brazilian A-1M, but there is no mention of this option in the colour schemes. It almost seems as though one of the options was not printed in the painting guide. Sprues E and M are provided twice to allow for the correct number of weapons. The fuselage is made up of two parts per half, accommodating the different noses for the Brazilian and Italian options. The intake trunks are complete right to the engine face, as is common for Kinetic kits. There are some ejector pin marks inside which will need some careful sanding to erase. The jet exhaust is a single piece tube with some turbine detaill moulded into the end. It is suficiently deep enough to look convincing. The instructions would have the builder complete the nose and rear fuselage as separate subassemblies and then join them together. The langing gear is also shown built at a rairly early stage and installed when closing up the fuselage halves. It may be possible to leave the nose leg out until after painting, but at least the tops of the main gear struts must be assembled before closing up. This will make masking a trifle tricky. The wheels are done in Kinetic's usual style of a hub with seperate tire halves to glue around it. The cockpit is quite complete, with etch HUD sides and seat belts adding to the well-detailed plastic parts. Careful finishing will make this rival anything the aftermarket can produce. The gatling gun muzzle piece E41 is shown in the instructions as being inserted into the large gaping hole in the nose part B2. This makes no sense, because E41 is very small, and will immediately fall into the nose. Part F22 looks as though it's a perfect match to fit inside that hole and give E41 a place to glue into. The gun muzzles for the Brazilian nose are moulded solid, and would benefit from a session with a drill bit. Brazilian and Italian aircraft have different antenna fits. The instructions are a trifle confusing regarding which parts are to go where for which option. Take the assembly slowly and perhaps cross off the parts which should not go on your version. Each wing is made from a top and bottom half, and has options for raised or lowered flaps and slats. 4 pylons are provided to hang things under the wings, as well as wing tip Sidewinder rails. The rudder is made of two separate halves and looks as though it may be able to move if the builder is careful. The tailplanes have separate trim surfaces which may be movable. These surfaces are most often seen in line with the tailplanes. The instructions show two sizes of drop tank, pylons and wingtip Sidewinders. Bombs, rockets and gun pods are provided on the sprues, plus a centreline reconnaissance pod. Careful study of reference photos wil show where these items are usually hung. Slide moulds allowed the sidewinders' rocket nozzles to be moulded open. I don't compare models to drawings or published measurements. When assembled it will look like an AMX. Colour scheme options are provided for one Brazilian and two Italian aircraft. The Italians are overall light grey while the Brazilian aircraft is medium grey with a dark green disruptive camouflage pattern on the upper surfaces. 3. A-11 International Security Assistance Force Task Group "Black Cats" 51o Sttormo Afganistan in 2009. There also seems to be a set of Brazilian markings in full colour with a Dalmation-spotted "101" supermiposed on a red lightning bolt and a white triangle shape with irregular cuouts. None of these markings are shown in the instructions. The printing used for the marking instructions is much less dark than in previous kits. A1A 5540 in a classic air-to-air pose. 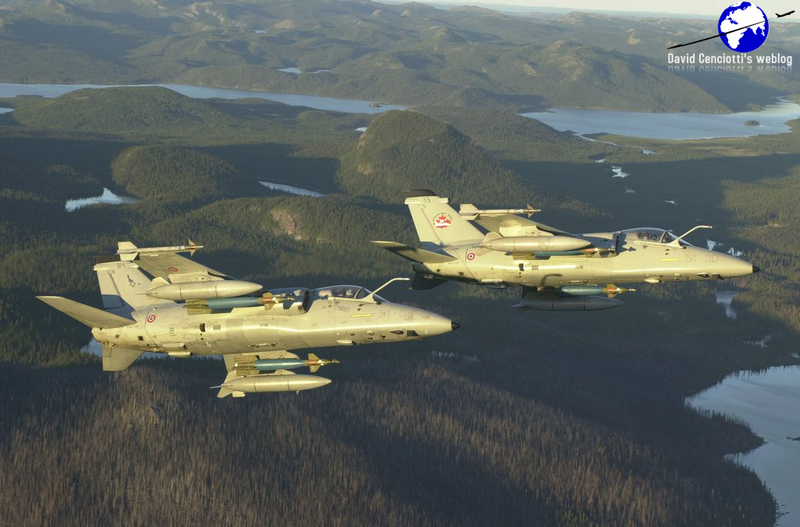 A pair of A-11s approaching the practise bombing range at CFB Goose Bay. This is a good kit, but not suitable for a beginner. You should have a few models in your experience and be happy with doing your own research to supplement the instructions. The many small parts may frustrate beginning modellers. Highs: An excellent kit made to modern standards. Lows: A few ejector pin marks mar the intakes, decal scheme with no instructions. Verdict: This is an excellent model which will make for something out of the ordinary.